Democratic candidates for governor Adam Cote and Janet Mills, who hold the top two spots going into the tabulation of Tuesday’s ranked-choice voting results. 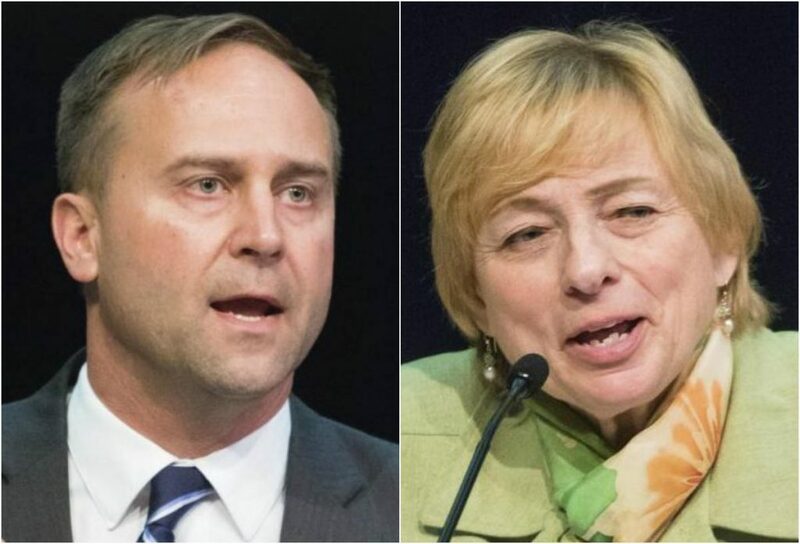 Either Janet Mills or Adam Cote will likely be on the ballot for governor in November – and it’ll be supporters of fellow Democrats Betsy Sweet and Mark Eves who will put one of them there. The winner of Tuesday’s Democratic gubernatorial primary was unclear Wednesday and likely won’t be known until early next week. But with 90 percent of precincts statewide reporting, Mills was maintaining a roughly 5,000-vote lead over Cote on Wednesday evening. Yet Mills’ 33 percent share of the vote totals – compared to Cote’s 29 percent – was well below the 50 percent threshold needed to win the race outright. As a result, Maine will see its first ranked-choice voting tabulation for a statewide race starting Friday. Both campaigns were closely watching returns trickle in while gearing up for an unpredictable – and unprecedented – process to determine the Democratic gubernatorial nominee. Cote’s camp was also feeling optimistic. “We are confident that when the votes are all counted, we will be the Democratic nominee and cannot wait to take on Shawn Moody and his steadfast support for the economic philosophy that has Maine lagging New England and the country when it comes to job, income, and economic growth,” Cote said in a statement. Mainers likely won’t know who won the Democratic nomination until next week because of the time required to collect ballots and retabulate the results. Under the ranked-choice system, voters select candidates in order of preference. If no candidate receives more than 50 percent of the vote in the first count, the candidate with the fewest first-choice votes is eliminated. Voters who preferred the eliminated candidate would then have their ballots added to the totals of their second-ranked candidates, and the ballots are retabulated. The process continues until one candidate has a majority and is declared the winner. Mills and Cote long have been regarded as the front-runners in the seven-person Democratic field, although ranked-choice voting has introduced additional uncertainty into the race. Sitting in third place with 16 percent of the vote Wednesday afternoon was lobbyist and advocate Betsy Sweet of Hallowell, followed closely by former House Speaker Mark Eves of North Berwick at 15 percent. Sweet and Eves campaigned together on a progressive platform and urged their supporters to rank the other second on their ballots. It is mathematically possible but unlikely – short of a perfect alignment of factors – for either Sweet or Eves to win the nomination with the reallocation of votes during the ranked-choice process. For Sweet to vault into second place, for instance, nearly all of Eves’ voters would need to have ranked her second on their ballots in order to push Sweet above Cote. Additionally, supporters of the three candidates below Eves – Mark Dion of Portland, Diane Russell of Portland and Donna Dion of Biddeford – would need to allocate more of their second-choice votes to Sweet than to Cote. The same dynamics would be true for Eves should he overtake Sweet in third place by the time all of the first-round votes are counted. Instead, voters who picked Eves and Sweet likely will determine the eventual winner as their votes are awarded to either Mills or Cote, depending on the rankings. That prospect had campaign staffers and political observers crunching all types of scenarios on Wednesday. For instance, will the fact that Cote and Eves are both from York County – an area with higher voter turnout – play in Cote’s favor? Or did more Sweet voters rank Mills as their second-choice because they want to see Maine elect its first woman governor? Sweet acknowledged it would take “a miracle” succession of events for her to surpass the two front-runners and win the nomination. But Sweet, who was the only Clean Elections candidate in the Democratic race, believes many of her voters placed Eves second and vice versa for Eves supporters in response to their collaboration and positive-message campaigns. Whoever eventually emerges as the Democratic nominee will face off in November against Moody, a Gorham businessman who avoided the ranked-choice process by winning 56 percent in the four-person Republican primary, based on vote totals available Wednesday evening. Mills, of Farmington, has substantial statewide name recognition thanks to her high-profile position as Maine’s attorney general. Cote is an Sanford attorney and 20-year veteran of the Maine Army National Guard who was the first major candidate to enter the Democratic primary race in April 2017. Results from the ranked-choice voting process probably won’t be available until Monday, at the earliest. By law, towns have three days to send the ballots to Augusta. On Thursday, a private courier service hired by the state will begin collecting the paper ballots and memory devices containing electronic voting records from the roughly 500 municipalities around the state for transport to Augusta. Secretary of State Matt Dunlap’s office plans to begin opening those ballot boxes and loading the paper ballots into the tabulation machines on Friday, It is a time-consuming process because staff must separate out the Democratic gubernatorial primary ballots from other races before feeding them into the machines, Kristen Muszynski, spokeswoman for Dunlap’s office, said Wednesday. The actual tabulation process will take place at the Elkins Building located at the former Augusta Mental Health Institute campus in Augusta, across the Kennebec River from the State House. The process is open to the public and will be conducted between 9 a.m. and 5 p.m., Monday through Friday. Muszynski said the office is not likely to begin using the ranked-choice algorithm to recalculate the race until Monday.